Meet Lenny the Ring-tailed Lemur. He came home with us from our holidays this spring. He's a lovely fellow, full of character but until this weekend he was missing something. What he really needed was a melted bead bow-tie. Wouldn't you agree?! Actually, Jessica did not. 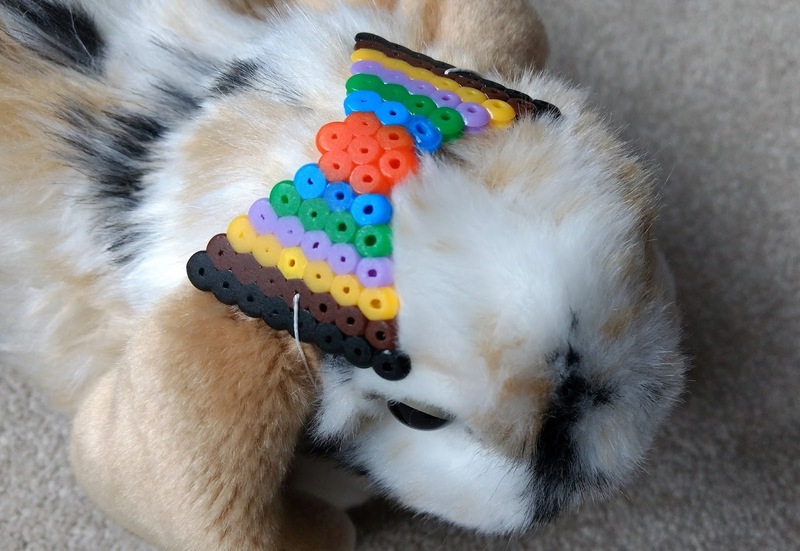 She has confiscated the bow-tie and given it to Flopsy to wear as a hairband. I don't mind this but I do think she would have preferred a more feminine piece. Ok, I shall be a little more serious now. 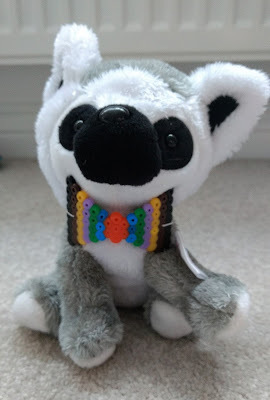 This all came about because I fancied trying something different with my beads and saw a post about making bracelets on Red Ted Art from a few years ago. 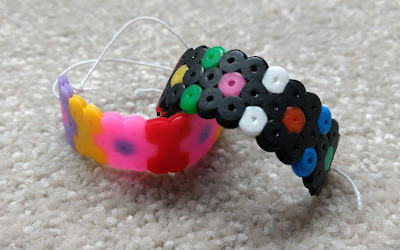 Maggy's tutorial is very clear so I won't go into too many details myself but because I was making these for a tiny 3 year old's wrist I used a small hexagonal peg board and shaped the hot beads around a toilet roll! Attaching elastic to the back of them is a great idea and they look brilliant on but Jessica's wrists were feeling camera shy I'm afraid. I can't honestly say how long they will last before they get snapped but I did melt the beads pretty well on both sides so we'll see. I now fear that a whole host of Jessica's soft toys may start putting in requests for melted bead jewellery. Still, it's something a bit different! In the interests of being honest, I should point out that I don't actually use Hama beads anymore. I source my melting beads from Hobbycraft these days. They sell their own version of "Picture beads" and I only ever buy them when they are half price (which is fairly frequently) when I can get 10,000 beads for £5. These are completely compatible with Hama peg boards and although the beads melt slightly faster than genuine Hama ones I have not been disappointed at all.